Hello my lovely pumpkins and welcome back to my blog! Today’s post is really special because I got to collaborate with the beautiful Rebecca from AllThingsAllatt. I’ve always loved her creative mind so I am happy we got to do this. 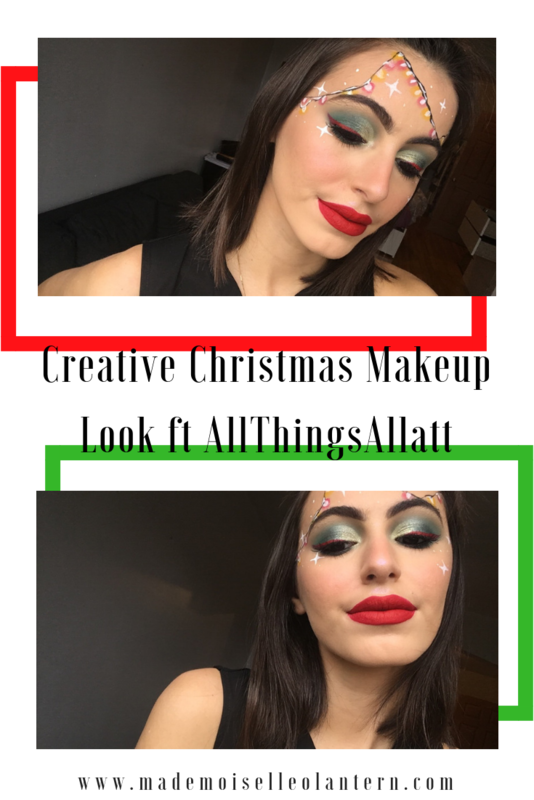 So what we got for you today is two beautiful, fun and creative Christmas makeup looks. Mine reminds me a lot of the Grinch :p. This is my last post until the 21st of December because I have my finals coming up and I have to study and then after I am traveling on the 18th and I don’t think I can publish a post in the plane :p so basically, I won’t publish anything for 2 weeks. Also, don’t forget to read my previous post: Christmas Gift Guide For Her & For Him, I shared with you some Christmas gift ideas! 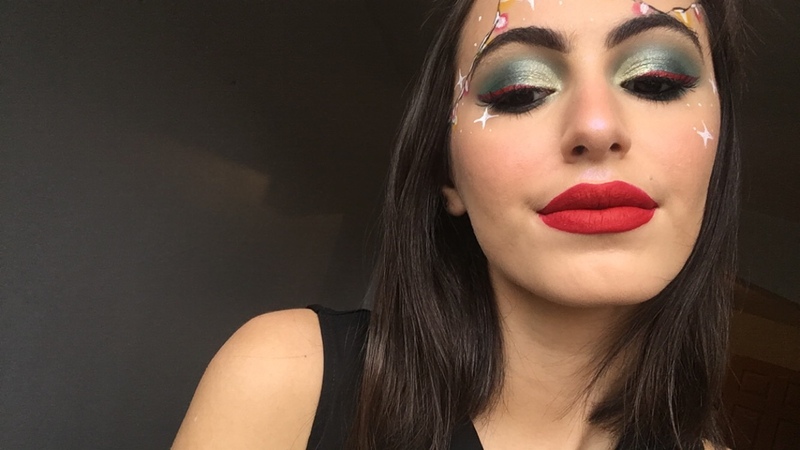 Second of all, I used this dark green shade, 1, on my crease and outer V.
Then, I applied that dark shimmery shade, 2, in my outer V.
Afterwards, I carved my crease and applied that goldfish green shimmery shade, 3, on top and in my tear dot. For my lower lash line, you guys know the drill, same thing as what I applied on my crease, shade 1 and 2. Applied my black highliner gel crayon by Marc Jacobs in my water line. For fake lashes, I used my Ardell lashes in “Natural” and for mascara, I used my Perversion mascara by Urban Decay. Blush: Shimmery matching Stix in “Ridiiic” by Fenty Beauty. 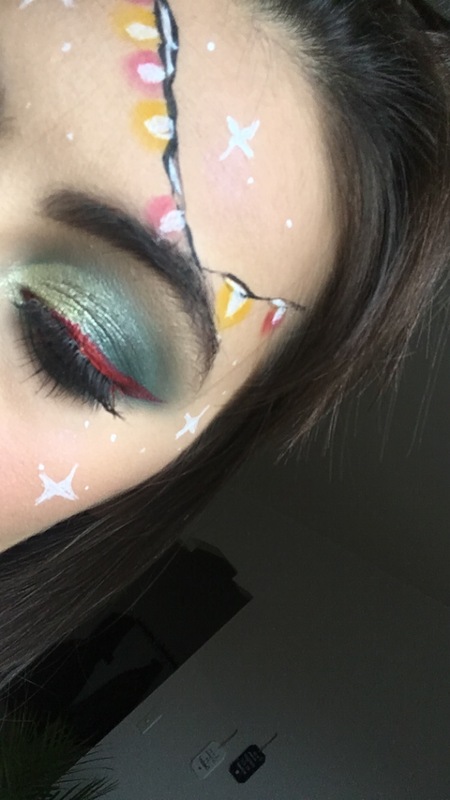 Lights+Stars: Creating the lanterns was so fun and easy, I started by creating the lines with black eyeliner [I use the one form NYX], then fill the holes with white liquid eyeliner [also, from NYX]. Afterwards, I drew circles in white and filled them in. And, to outline them, I just took my yellow eyeshadow by Sugarpill Cosmetics. in “Buttercupcake” and my matte liquid lipstick in “Mary Jo K” by Kylie Cosmetics [I first applied on my hand, to not make it to harsh]. 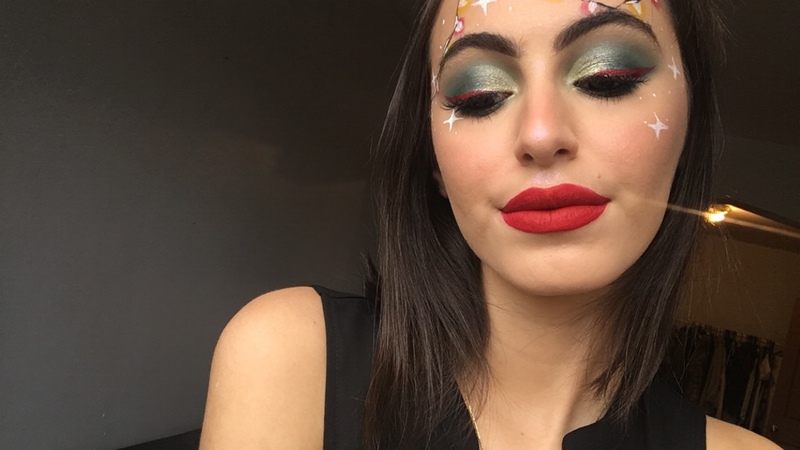 At the end, I drew dots and stars all around to give my makeup look a more festive look. Setting spray: Rose Water Facial Spray by Mario Badescu. Don’t forget to tag me if you ever recreate this look, I would love to see your recreations! That’s it for today. I hope you enjoyed this post and if you did, don’t forget to give it a ‘like’ and to follow my blog [you can do that by email if you don’t have a WordPress account]. I love that green palette! I think it will make my brown eyes pop! yesss, green is so flattering honestly! You did an amazing job! I love this look, actually you both did an amazing job! Good luck with your finals honey! Your makeup is always on point! You rock red lips girl! Red and green is so about this holidays! awww thank you so much, I really appreciate it! and yes red and green are the classics! 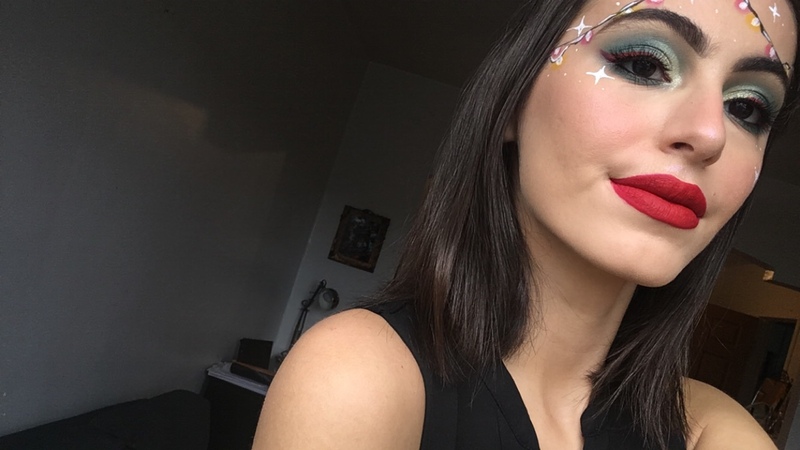 I love your makeup look! 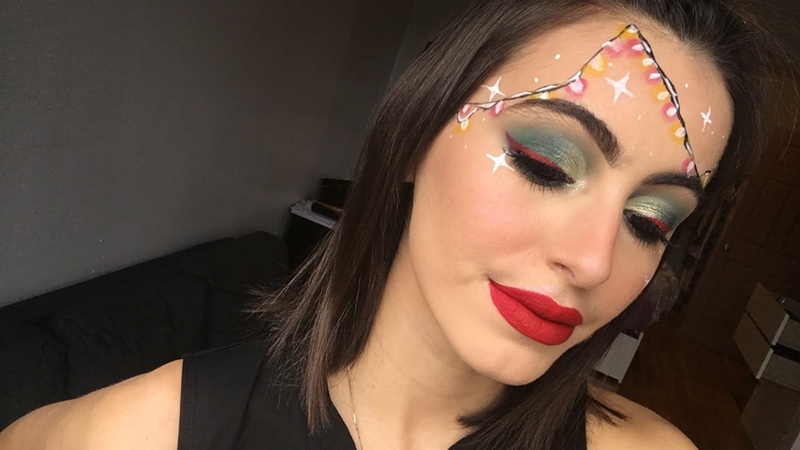 It’s so creative & you look gorgeous! That emerald palette is gorgeous. I love how shimmery the colors are! 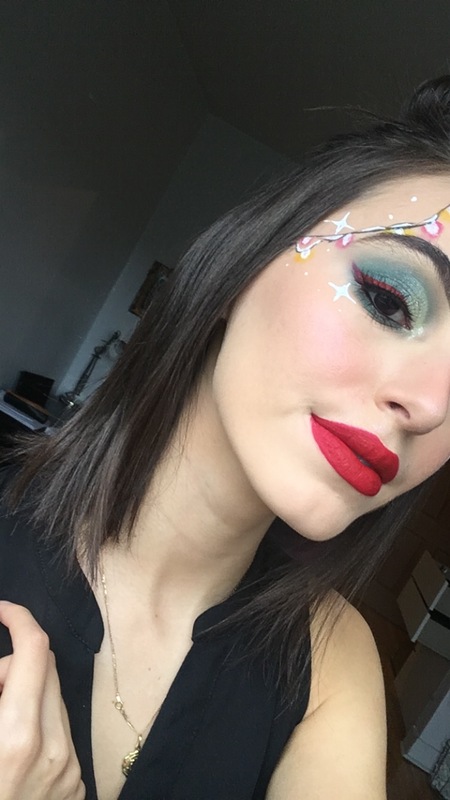 And you can’t go wrong with a bold red lip at Christmas! yes exactly!! Thank you very much, I really love that palette, I don’t regret buying it!! Love that palette and your artistry is so awesome!! This is so creative and pretty! I love it so much! That red eyeliner with the green shadow is just stunning. So creative and gorgeous !! This is so cool! I’ve never seen something like this, so festive! This is so fun! I’ve been looking for a new green eye shadow so I’ll have to check out this palette!